It has been a long off-season for duck hunters and we’ve all been watching the weather hoping for the first cold snap to send birds funneling south. The first week of duck season is always a special moment in a duck hunter’s life, but being prepared for early season duck hunting is just as important. We’ve spent the off-season working with our dogs, repairing decoys, and patching duck hunting waders in anticipation of Opening Day. It’s finally here! Are you ready? We have no control over duck hatches, weather, or ducks on our favorite ponds, but we can prepare for the first week of duck season in hopes that early season hunting goes as smooth as possible. Here are the top ways to prepare for the first week of waterfowl season. Types of decoy spreads and calling techniques vary greatly for early season ducks depending on what flyway you hunt. First season birds still in Canada and Northern states are in small family groups when the season opens. Birds already on the wintering grounds in the Southern states have merged during migration and are in much larger flocks. An effective early season strategy for hunting northern birds is to use small groups of decoys no more than a dozen in each group. Each group should be set within shooting distance with no more than 20 yards of open water separating them. Calling should be calm and laid back, mimicking comfortable ducks that have been using an area for weeks. In the south, large decoy spreads and aggressive calling are the best tactics for first week birds. Large hail calls, quacks, and feeding chatter all help to create the illusion of a large raft of feeding ducks. Some outfitters in the south use as many as 1,500 decoys during the early season. That’s way more than the weekend duck hunter can haul to the blind, but 5 to 10 dozen decoys seems be enough. With the exception of flooded timber, it’s usually accepted for early season that the larger the spread, the more ducks you’ll attract. It’s important when setting large first week spreads that landing holes and flight lanes be placed at random spots within range of the blind to prevent ducks from swinging wide and trying to land on the edge. It’s easier to judge the distance of ducks in flight if you predetermine the distance to the landing spots you have positioned with your decoys. 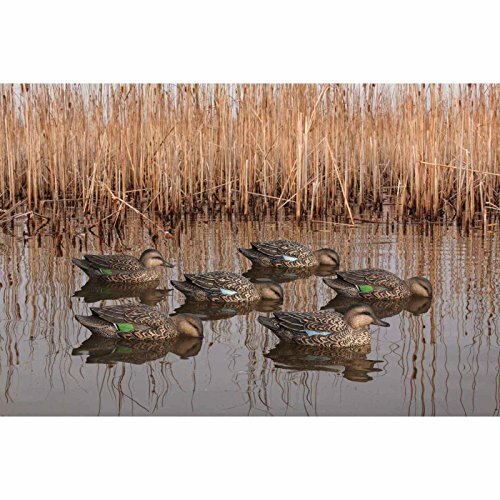 Avian-X Top Flight Early Season Teal Decoys work great during the first week. Preseason scouting is best done in northern states where breeding populations remain over summer and can indicate areas they prefer. But regardless of where you’re hunting, it’s important to familiarize yourself with the areas you’re going to hunt on opening day. It’s important to talk to as many other hunters, biologists, and game managers as possible to get up to date reports of duck food conditions and water levels to help make your first week hunting plans. This the perfect time to reassess duck food plots and what’s growing where. Unless a tropical storm hits southern states, early season tends to be rather dry. Identifying these issues before hand will help prevent showing up on opening day to a dry pond or creek bed. Even the prairie pothole region of the Dakotas can be dry on certain years. Early season scouting is vital to killing ducks on opening day, and it’s best to cover as much ground and as many types of wetlands as possible. This is the best time to locate promising areas to hunt and ask permission from landowners for the upcoming waterfowl season. Early season scouting is especially important for determining where certain species of ducks will be on opening day. Blue-winged teal like shallow, drying areas with mudflats while gadwall like more open wetlands with better water. Bluebills and other divers like deeper open water and feed on mussels or small invertebrates. Early season mallards tend to flock to grain and agricultural fields in the northern states. Finding a large pond near an ag field can be dynamite for opening day of duck season. Finding these large groups of mallards and the fields they are using is the key to determining a strategy that will work for first-week hunting. Even though southern states don’t have as many local birds to indicate prime areas to hunt, it’s still important to know about water conditions in the areas you plan to hunt. Artificially flooded flats are a staple down south, especially on WMA’s and public land. Many hunters have shown up on opening day down south only to realize they can’t even float a decoy. It’s not a pleasant experience and early season scouting could have prevented it. As opening day approaches, look for gadwall, widgeon, and teal in open flats, flooded fields, and marshy areas with cattails. Pintails on the other hand prefer large expanses of shallow water, flooded fields, and coastal bay areas. If mallards don’t make their way down to you on the first day of the season, target these other shallow water ducks. Pro Tip: Puddle ducks can be difficult to hunt during the first week of the season. Use these 7 tips to help more puddle ducks on opening day. You may think that you don’t need to be on your game for early season hunting, but this couldn’t be further from the truth. Properly covering your blinds and hiding well is vitally important for opening day hunting. Even if you have the most realistic decoys and the best calling, not being thoroughly hidden often means you’ll be less successful. Regardless of the types of blinds you choose, the best blinds blend in with the surrounding terrain and look natural. And while there are many different camo patterns available, it’s often difficult to completely blend in with early season terrain. Cattails and bulrush marshes may require patterns with more yellow like ShadowGrass, while flooded timber or stubble fields may require different shades of brown, such as Max-4. Temperatures can also be highly variable during early season. It could be freezing in the northern states and 80 degrees down south. It’s best to dress in layers for first week hunting so that clothes can be taken off or be put back on depending on activity levels. A long sleeve fleece pullover makes a good opening day outerwear garment that can be shed once the chill of early morning is over. In the south, insect repellant and bug-tamer suits are the norm until the first few cold fronts arrive. Being properly covered and camouflaged will help you be more successful on opening day. 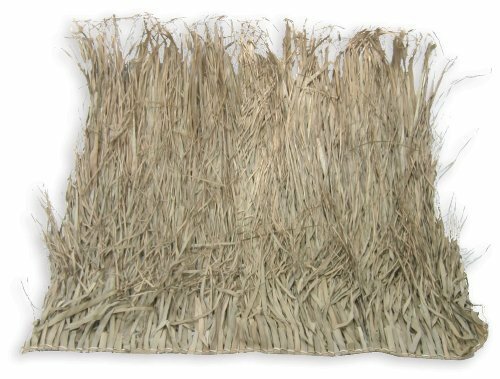 Natural Grass Mats can be a quick way to add a base layer to your existing blind. As with dove, deer, and other hunting seasons, opening day is the busiest time of the year, especially on public land. The more popular an area is or productive, the more that this holds true. Having other hunting options during the first week of the season is the best way to avoid these high-profile areas. Ducks will get blown off the public areas extremely quick, and they’ll be looking for small secluded spots. Having a few small potholes to hunt probably won’t attract as many ducks, but the hunt will be more enjoyable and rewarding. Another trick is to time your hunts to avoid the peak times other hunters are in the field, such as weekends. Weekend hunting should be avoided at all costs on public land. The hunting pressure is usually twice as heavy as any other day. The best time to hunt public land is during the week on Tuesday and Wednesday. Hunting later in the day can also help avoid the pressures that crowds put on first week ducks. This works well especially for timber hunting where action is hot early in the morning and the mid-morning hours are slow. Waiting out the mid-morning lull can lead to great decoying action around 10 or 11 a.m. Looking for a new barrel camera to film your hunts? Check out our top picks here! In order to be prepared for the first week of duck season, it’s important to thoroughly assess all your hunting equipment that has been sitting idle for the summer. This includes ATVs, SxS, boats, motors, trailers, guns, and decoys to make sure they are in working condition. Nothing is more frustrating than putting the boat in the water on opening day and realizing the carburetor is gummed up and the motor won’t start. Having a good early season routine of servicing the equipment you’ll be using will help you be prepared for opening day. Stagnant and water filled fuel is one of the leading causes of power equipment issues after sitting for long periods. Any equipment you plan to use for duck season should be started prior to use so that you can address any issues before you get the field. Trailer bearings, wheels, and tires should be inspected and replaced as needed. Guns should be disassembled and cleaned if you put them up dirty from last season. A little shot of oil never huts to get some life back in them. Patterning your shotgun and choosing the best choke tube can all be done before the season starts. The early season is the perfect time to get the kinks worked out of all the equipment you plan to use. If something were to go wrong, and you end up being stranded, it’s better to happen when the temperature is mild, rather than the middle of a cold winter. 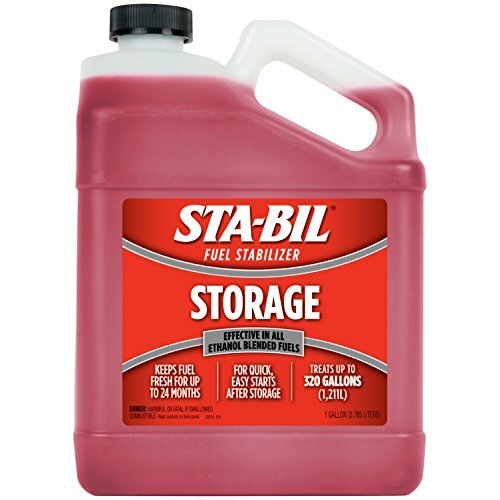 Use STA-Bil in your fuel to reduce water buildup from ethanol. If it’s been a dry year and water is scarce, floating your local creeks and rivers in a small boat or kayak can be productive in finding areas to hunt for opening day or skull hunting opportunities. Small river duck hunting is usually best during early season when the birds aren’t gun shy. Camo or natural earth tone boats work the best for float hunting. But you can also rig a portable blind to the front to mask your movements. Let the current take you slowly or paddle downstream. The person in the front of the boat is the shooter while the person in the back controls the direction. Both hunters should be wearing camo from head to toe, and especially pay attention to bends in the river or creek where sandbars and grass flats are likely to exist. Ducks will key in on these areas and a slow float will often get you well within shooting range before they flush. Float boats can have an outboard or trolling motor attached, but it’s against the law to shoot from a boat being propelled by a motor. Check your states laws regarding floating blinds as well as streamside trespass laws. If you’re like most hunters, your freezer is packed full of game meat that really could use some thinning out. Prior to the first week of duck season, evaluate your freezer space to start making room for the ducks you anticipate putting in it. Making it a point to eat game meet at least once a week is a good practice for freeing up some freezer space. The first week of duck season is also a good time to evaluate what you plan to do with the duck meat after you harvest it. Seared duck breast by itself with a glaze is a popular way to cook duck meat, but maybe smoked sausage is on your list this year as well. However you plan to prepare it, make sure you have enough freezer space to do so. Duck hunting the first week of the season is vastly different than any other time of the year. Rather than the freezing cold weather and snowy conditions we think of for winter duck hunting, early season mild temperatures require a different approach. Prior to the season starting, scout as many areas as possible to gauge local water and food conditions. If you’re hunting up north set small family size spreads and reduce your calling to a minimum. For southern hunters, larger duck spreads are best and aggressive calling is effective for hunting larger groups of migrators. Matching your camo to the terrain around you is especially important during early season when most vegetation hasn’t fully wilted or died off for the season. Avoiding public hunting areas on opening week and trying more secluded spots can result in a better hunting experience overall. Servicing all your hunting equipment prior to opening day will help ensure that you’re not left stranded at the boat ramp or marsh. Clearing freezer space will give you a spot to store duck meat without having to discard other meat or get another freezer. Do your homework in the off-season to prepare for opening day and the first week of duck season. Adjust your hunting techniques for milder conditions of early fall and you’ll start the season off with success. Need a new duck hunting sled? Check out our to picks here.